Grace, the mare I crystal planted for recently, to help in birthing, had a beautiful foal in the early hours of this morning. Both are doing really well - photos to follow! 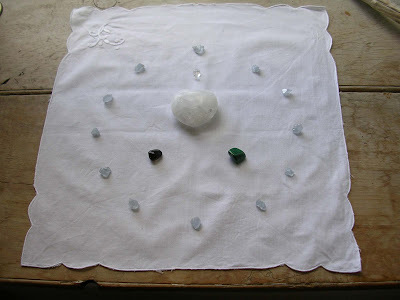 Please use the image below, of the rock formation to the point of planting of the crystal configuration for this meditation, as a positive focus. (Further details in 18th May 2012 blog posting). News of the worsening food crisis in Yemen, due to the political unrest in the region, prompted the focus for tonight's meditation. However many around the world face famine, starvation or food crisis. 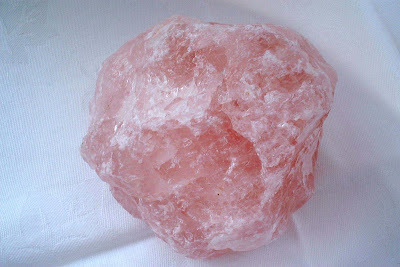 This meditation will use Pure Strength and Pure Peace sets combined with celestite. Please visualise the Earth in her true form, with bountiful supplies for all. I did some crystal planting yesterday to help a horse locally, who is due to foal. There are many ways to use crystals to help birthing in animals. With horses, the field or stable can be gridded with appropriately programmed selenite to help with flow and pain relief. 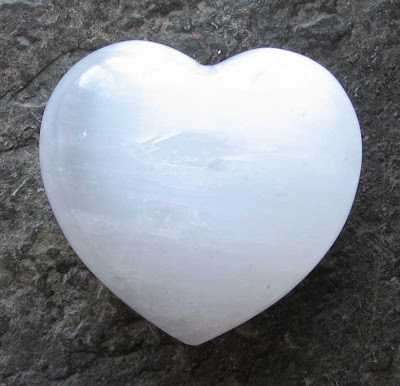 However in this case I planted a Pure Grace (selenite) Heart, with the birthing programme over-layed to the crystals original programming, midway between the horses field and stable. This felt perfect, as the mare is being kept out in her field during the day and inside at night until she gives birth, so it saved having to potentially grid both areas, as the energy of a Pure Grace Heart has the capacity to radiate out over a considerable distance. Also the horses name is Grace, so it felt one of these beautiful selenite crystals would be of particular connection to her. I met with some fellow crystal planters last weekend and we did some personal and community crystal planting in the area of Banff and Gardenstown on the North East coast of Scotland. The community planting involved placing the heart meditation circuit which is being used as a focus on the 1st, 12th and 24th of each month through midday into the earth, through 12pm on the 12th May. This felt very special and a new of working to be able to connect with the meditation crystals actually planted into the Earth herself. We were blessed with a beautiful day and a friendly spaniel who suddenly appeared and accompanied us all the way until the crystals were placed and who interestingly had a sore to the area of her own heart chakra. Just had a lovely email from a colleague about the meditations at Easter. Apparently she had taken the meditation group she leads in St Ives, England, out on Good Friday and they had connected in from a point by the sea to the sounds of the waves and seagulls calling, and in the sunshine. They enjoyed it so much that they then repeated it again on Easter Sunday. It is always inspiring to hear others experiences and a reminder that meditating outside can be a very beautiful and powerful experience. One of the spectacular things about Orkney is its rich and varied bird life, especially at this time of year with the increasing daylight, and warmer weather. 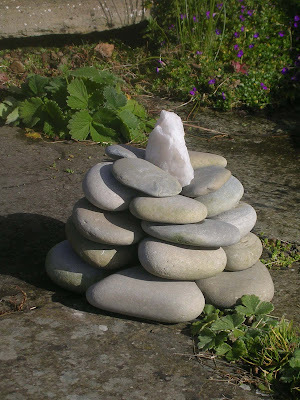 We encourage birds in the garden, here at Old Nisthouse by feeding and also using snow quartz crystals in shallow dishes of water for the birds to drink and by the presence of the snow quartz cairn. The snow quartz in the drinking water provides a sustaining light charge to the birds drinking it, particularly important in the winter months, whilst the cairn attracts all types of wildlife, radiating out an energy of gentle peace and healing to all. However at the weekend I found a starlings nest complete with eggs in my in my car engine - a step too far perhaps! This type of nest building activity is not uncommon in Orkney, and this particular nest had made several journeys away from the house, with the mother bird simply returning to the nest on the cars return, before I realised what was going on. Unfortunately I had to take the nest out, as too many vehicles have ignited here, including a brand new tractor, because of similar nests setting fire. Sadly, attempts to transfer the nest elsewhere failed as it collapsed, but we do have some starling eggs found abandoned elsewhere the next day, incubating on the Aga! Recently planted two more Rose Hearts of Light for planting (shown below), to bring peace and healing to two sites in the Cairngorm area of Highland Scotland. One was to the Highland Wildlife Park, which gives sanctuary to native and non native species and promotes conservation and protection of wildlife. We happened to visit just after a new tiger and polar bear had been introduced. The crystal was planted to the central area of the park, near to the polar bears, as they felt to be in most need, in their somewhat muddy enclosure and in the process of adjusting to being with each other. However the crystal was programmed for the whole park and will help all the animals in its vicinity. The second heart was planted to land just outside the village of Dalwhinnie, where we were staying, on a hilltop where Bonnie Prince Charlie is reputed to have encamped his army after raising his standard at Glenfinnan. The site is shown below.